One of the important concepts to understand when it comes to money is that of opportunity cost. When you make spending decisions, it’s a good idea to step back and consider the opportunity cost. What are you giving up in order to make that spending choice? Remember, your resources are finite, and you can’t be in two places at once. If you want to make the best decisions about using your money and time, it’s a good idea to consider opportunity cost before you commit your resources to a course of action. What Else Could You Be Spending Your Money On? When thinking of opportunity cost, consider what else you could spending that money on. Once that money is gone, it’s gone — whether you are making a small purchases or a large purchase. That money can’t be used for something else, and you have to put forth the effort to make more money if you want to replace what has been used. One of the best things you can do is consider how you want to use your financial resources. What is most important to you? I don’t really care for having a big TV. I’d rather go on a trip. I have limited financial resources, so I can choose the TV or the trip. If I buy the TV, I can’t go on the trip. I’ve given up the opportunity to do something I really want, in order to purchase something that I have very lukewarm feelings for. It’s true that I could always earn more money, and do both things, but then I would have to expend time and effort to make more money to replace what I spent on the TV. In reality, I’d rather just go on the trip. Having a massive TV isn’t that important to me. When you consider opportunity cost, it becomes easier to prioritize your spending. Think about what you most want to do with your resources, whether it’s saving for retirement, giving to charity, or improving your home. If you keep spending money on the unimportant things, you won’t have the financial resources to do what matters most to you. The opportunity to do what you really want is gone because you used your money on something that you aren’t that interested in. Another consideration with opportunity cost is your time. If you are willing to spend a little time, you can usually earn more money. However, there is no recovering lost time. That is something you really need to consider before making a decision about how you use your time. 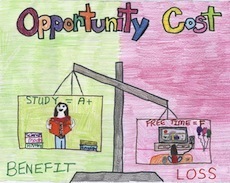 There are a few things to consider when you think about opportunity cost and time. First of all, what are you missing out on when you use your time for something else? If you decide to go to the movie, you might not have time to go bowling. You might not have time later to go bowling, and the opportunity is gone (at least for now). If you decide to work overtime, you have more money, but you might not have as much time to spend with your family, enjoying each other’s company. Think about how you are using your time. What if instead of spending three hours watching TV, you decided to work out, or learn something new, or even start a side business. Think about how you are using your time, and how you might use it more effectively for things that are more important to you. Keep a journal of how you are using your time, and then decide whether or not your time could be used to improve yourself, your quality of life, or your financial situation. Finally, don’t forget that your time might actually be more valuable than money. If you spend the time doing something mundane and tedious, rather than doing something fulfilling, you can’t get that time back. If you have the financial resources to pay someone else to do it, it might be worth it in order to free up your time to do something that you find more fulfilling — or profitable. What do you think? Do you think about the opportunity cost of your decisions? I think about opportunity costs all of the time. It’s probably why I never buy myself anything. 🙂 I always think of other things that I would like instead.